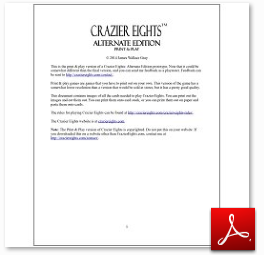 You can download a PDF of the Crazier Eights: Alternate Edition Print & Play here. (Right click, save as.) Note that this is a prototype and that the final version of the game could end up being somewhat different. I made a rules document for this version of the game, and you can get it here. Print & Play games are games you have to print out yourself. To play with these cards, you can print them on cardstock or on paper that you paste onto cards. 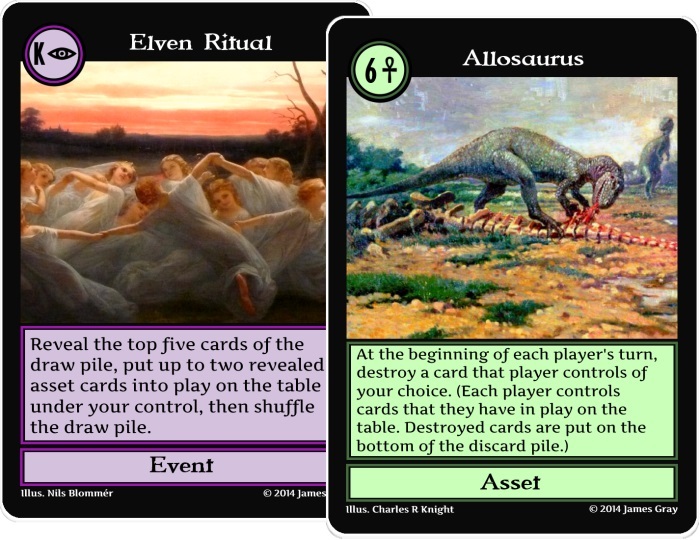 All the regular cards in the Second Edition can be viewed online in the Alternate Edition spoiler. The Alternate Edition has one main rule not found in the ordinary First Edition rules document: When a player loses the game, that player puts all cards she controls and all cards in her hand on the bottom of the discard pile. Keep up with Crazier Eights news & let me know what you think by following the official Crazier Eights Facebook page. This entry was posted in crazier eights and tagged second edition. Bookmark the permalink.